Troops in Operation LAFIYA DOLE have been making tremendous progress in the ongoing Operation DEEP PUNCH 2 in the various Sectors. So far, the troops have neutralized over 50 Boko Haram terrorists, destroyed and captured high calibre arms and ammunition, especially in the Lake Chad general area. Troops on Monday 8th January 2018, cleared Boko Haram terrorists in Metele village, Tumbun Gini and Tumbun Ndjamena. During the clearance operations, Boko Haram terrorists abandoned the area in disarray leaving behind livestock, large quantity of foodstuff, motorcycles and donkeys. Also in Metele however, the terrorists attempted to attack troops in harbour, but this was stiffly resisted with heavy casualty on Boko Haram terrorists. Troops neutralized over 57 of them, destroyed gun trucks and and other equipment. The gallant troops also discovered terrorists’ logistics base at Tumbu Ndjamena which held stocks of fish, foodstuffs, fuel and motorcycles. All these items were promptly destroyed. Troops also captured 1 Anti-Aircraft Gun, 116 rounds of 12.7mm ammunition with metal links, 4 Ak-47 rifles, 57 rounds of 7.62mm ammunition (Special), 2 Light Machine Guns, 2 Rocket Propelled Grenade 7 (RPG 7) Tubes, with one RPG Bomb and 2 already primed 36 Hand Grenades. Other recovered items include 1 Small Solar panel with a Gionee mobile phone, 1 Holy Qur’an, 6 Hadith Books, as well as 5 Gun trucks (which were destroyed). Sadly, 4 of our troops paid the supreme price while 9 others were wounded in action. 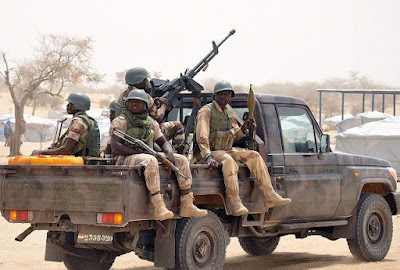 Specifically, a Boko Haram vehicle laden with Improvised Explosive Devices rammed into an MRAP vehicle which exploded killing 3 soldiers, a Civilian JTF and wounding the other soldiers. The bodies of the gallant and wounded heroes have been evacuated to 8 Division Medical Services and Hospital, Monguno.